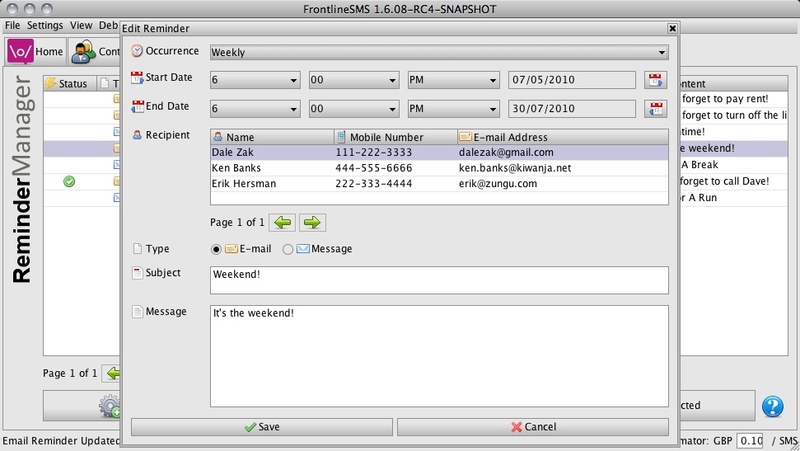 For some time now users have been asking how they can schedule SMS reminders in FrontlineSMS. Well, now they can thanks to some great work by Dale Zak on a ReminderManager plugin. Not only is this great news for the community, but it's great news for us, and is testament to the growing interest external developers are taking in the software "FrontlineSMS is powerful open source software that turns an ordinary laptop and mobile phone into a low cost communications hub. It's used by NGOS around the world to send and receive text messages for such efforts as human rights monitoring, disaster relief, education programs and fundraising campaigns. It's also at the heart of FrontlineSMS:Medic which is revolutionizing global health by empowering rural healthcare workers. So when my friend Lucky Gunasekara asked if I could develop a much requested reminder plugin, I jumped at the opportunity. For one, it gave me an excuse to dive into the FrontlineSMS source code. And two, it would benefit the entire community. 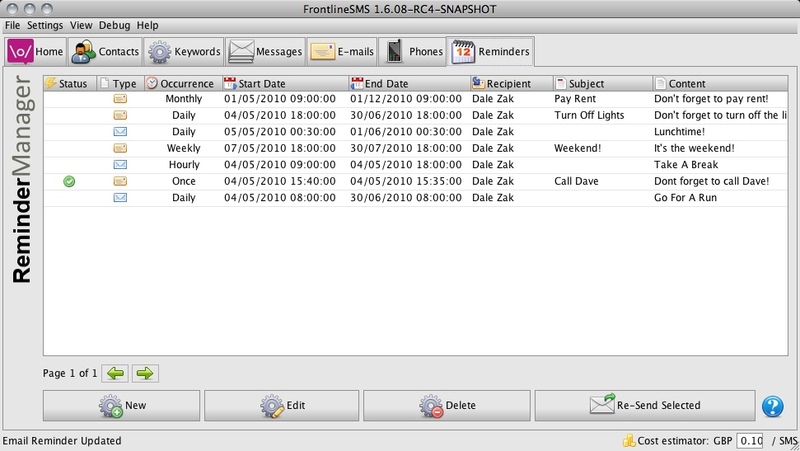 The FrontlineSMS Reminders Plugin allows you to schedule email and SMS reminders for a specific date range occurring once, hourly, daily, weekly or monthly. There was a bit of a learning curve to develop the plugin, especially with my somewhat limited Java, Hibernate and Thinlet experience. Thankfully Alex Anderson and Dieterich Lawson were great help answering my questions on the FrontlineSMS Google Group. The plugin definitely has room for improvement, and I already have a few ideas for additional occurrence types - Every Weekend, Every Weekday, Every Sunday, etc. You can checkout the source code here: http://github.com/dalezak/FrontlineSMS-Reminders"
You can read the original article here. Thanks to Dale for kindly giving us permission to republish.